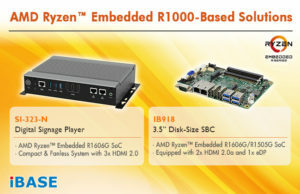 Taipei, Taiwan, April 16, 2019 – IBASE Technology Inc. (TPEx: 08050), a world leader in the manufacture of industrial motherboards and embedded systems, has unveiled two new AMD Ryzen™ Embedded R1000-based offerings, including the IB918 3.5-inch form factor SBC and the SI-323-N digital signage player with three HDMI. The models use the AMD Ryzen Embedded R1000 SoC, combining the high-performance AMD ‘Zen’ CPU and ‘Vega’ GPU architectures to achieve a new class of performance for next-generation embedded designs. “AMD and IBASE have been working hand in hand to deliver computing solutions with unprecedented performance and power efficiency for various applications such as AIoT, gaming, POS, kiosks, digital signage, and factory automation,” said Archer Chien, Director of Solution Product Planning Dept. at IBASE. “This successful partnership is only made possible by leveraging AMD’s latest powerful and scalable SoC solutions with IBASE’s strong design and manufacturing capability. 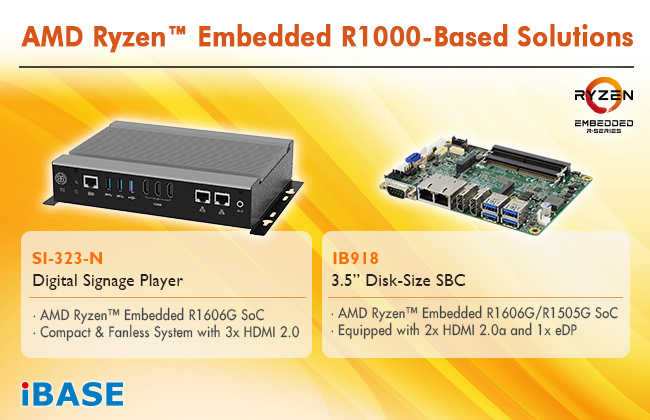 The IB918 3.5-inch SBC is powered by AMD Ryzen Embedded R1000 SoC, using either the new dual-core R1606G or R1505G model, and optional heatsink with fan. It supports up to 32GB DDR4-2400 and ECC memory modules. Storage and expansion sockets include a M.2 M-key interface, two M.2 slots for type 2280/2230 architectures. It is also equipped with 2x HDMI, 1x eDP, 2x GbE ports, 4x USB 3.1, 1x SATA III and a 12V~24V DC input. The SI-323-N digital signage player utilizes high-performance, power-efficient AMD Ryzen Embedded R1606G processor integrated with enhanced AMD Radeon™ Vega 3 graphics. Suitable for menu boards in restaurants, electronic displays in banks, airports and shopping malls, this compact and fanless system supports three HDMI 2.0 with independent audio and hardware EDID, as well as IBASE’s own iCONTROL intelligent green technology and Observer monitoring technology. IBASE Technology (TPEx: 8050) is a reputable supplier specializing in the design and manufacturing of robust industrial PC products. Since its establishment in 2000, IBASE has been committed to the production of high quality products, and to the rendering of excellent services. IBASE carries out manufacturing and quality control at its own production sites in Taiwan that are certified to meet ISO 9001, ISO 13485 and ISO 14001 standards. Its current product offerings comprise of x86 and RISC based industrial motherboards, embedded systems, industrial panel PCs, digital signage players and network appliances for various applications in the automation, digital signage, AIoT, gaming, transportation, smart building, medical, retail and networking markets. For more information, please visit www.ibase.com.tw. AMD, the AMD logo, Ryzen, Radeon, and combinations thereof, are trademarks of Advanced Micro Devices, Inc.